The new year brings with it a chance to reflect on achievements made in 2018 and a chance to dream about what 2019 may hold. Hopefully by now any new year resolutions are still going strong, but if not, you don’t have to wait until the following year to start setting new challenges and goals that you want to achieve. It is the mission of the School Games to provide ‘more young people with the opportunity to compete and achieve their Personal Best’. This includes competing against oneself and others to improve personal performances with a focus on the process rather than the outcome (on the learning and values development of the young person rather than just the result). Within the School Games, Personal Challenge is a student driven/self-led opportunity to attempt to improve your performance and can take place both at school and beyond the school day. How you go about choosing what challenges you want to take on should be personal to you, and not just because a friend or someone else has told you so. · Become stronger by helping others – set yourself some bodyweight strength challenges or do more chores around the house such as hoovering and gardening. · Improve your fitness and reduce screen time – walk with your family when collecting food and help carry it back. You might also learn more about eating healthier at the same time. · Prepare well for your upcoming exams – taking regular physical activity breaks between school work can help you de-stress, refocus your mind and give you the energy to go again. TIP: Your brain works better when standing so could you do all your revision standing up? View our Personal Challenge videos. So, the new year brings an exciting opportunity for you to start making a difference towards improving your performance and being a better you through setting your own personal challenges. 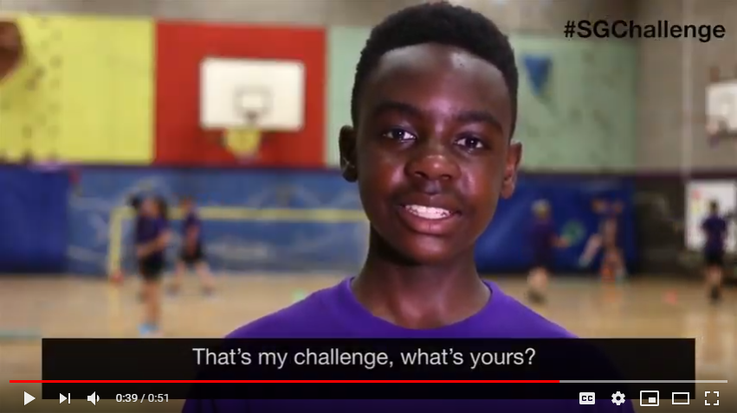 However big or small, share them with us by using the #SGChallenge and join a movement of people in the School Games becoming challenging themselves to become better than they were yesterday.